This year, eleven Foxconn employees have fallen to their deaths at the company's Shenzhen factory. Sony and Nintendo are investigating the issue. What does Apple's Steve Jobs think? According to Reuters, Jobs says the rash of suicides is "troubling", but that the Foxconn factory "is not a sweatshop". It is important to note that the number of suicides at the Foxconn factory is below the national average. Suicides are typically higher in rural China, but factory workers tend to have a low suicide rate. 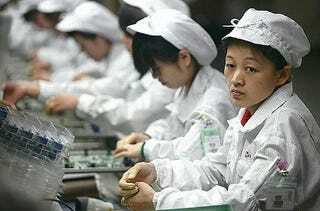 Moreover, while suicides are more common among Chinese females, many male Foxconn factory workers have committed suicide. It is also important to note that there are reports regarding the oppressive work environment at Foxconn. The Chinese government is getting involved to help prevent future suicides. "It's a difficult situation," Jobs said about the suicides. "We're trying to understand right now, before we go in and say we know the solution." Foxconn manufactures the Apple iPod, iPhone and the iPad as well the Xbox 360, the PS3 and the Wii.